Ensuite to master bedroom with dressing area. Log burner fitted to the living room. **immaculate condition** This is a beautifully presented 3 bedroom semi-detached home situated in an idyllic cul de sac location in Arlesey. The property benefits 3 good sized bedrooms with an ensuite to the master, a newly fitted kitchen diner, log burner and a garage with off road parking! Arlesey is a small town and civil parish in the district of central Bedfordshire. It is located near the border with Hertfordshire, about three miles north-west of Letchworth Garden City, four miles north of Hitchin and six miles south of Biggleswade. Arlesey railway station provides train services to London, Peterborough, and Stevenage. Front door leading to the entrance hall. Stairs rising to the first floor. Wood effect flooring. Radiator. Electric fuse box. 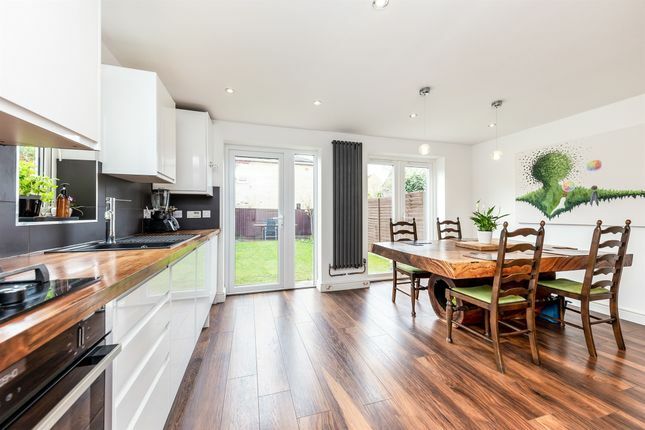 Bright and airey living room with a walk in bay window overlooking the front of the property. Log burner with fue. Wood effect flooring. Door leading to inner hall. Door leading to the kitchen diner. Door leading to the down stairs WC. Wood effect flooring. Downstairs toilet with WC and wash hand basin. Radiator. Wood effect flooring. Fantastic sized kitchen diner. Newly fitted kitchen with a range of wall and base units with solid wood worksurfaces around. The kitchen comes with oven and gas hob with extractor over, wine rack, intergrated applicances (washing machine, fridge freezer and dishwasher) and a sink with drainer. Central heating boiler. Spot lighting which can be section to areas with ceiling lights over the dining area. Two sets of patio doors leading to the garden. Window to the side aspect. Wood effect flooring. Doors leading to all bedrooms and family bathroom. Loft access (built in ladder, loft is partically boarded). Airing cupboard. Bright master bedroom with windows overlooking the rear of the property. The master bedroom opens onto the dressing area. Fitted carpet. leading from the bedroom the dressing area has fitted wardrobes. Window overlooking the rear of the property. Door leading to the ensuite shower room. Fitted carpet. Fully tiled shower room with wash hand basin, WC and shower cubicle with Aqualisa digital shower and rainfall shower head. Spot lighting. Heated towel rail. Tiled flooring. Great sized second bedroom with windows over looking the front of the property. Radiator. Fitted carpet. Window over looking the front of the property. Radiator. Paved front garden. Electric power socket. Beautifully presented rear garden with two newly-laid patio areas. Mainly laid to lawn, enclosed by timber fencing. Out side tap. Electric power socket. Garage with parking to the front. Up and over door. 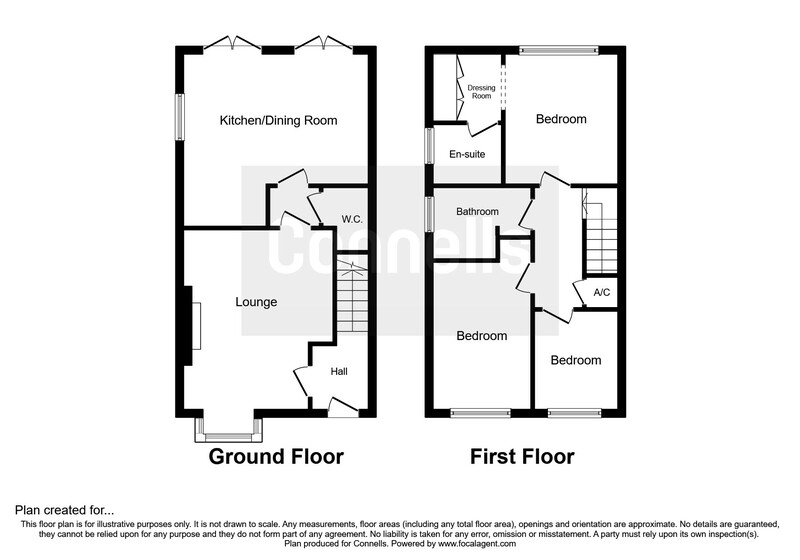 Property descriptions and related information displayed on this page, with the exclusion of Running Costs data, are marketing materials provided by Connells - Letchworth, and do not constitute property particulars. Please contact Connells - Letchworth for full details and further information. The Running Costs data displayed on this page are provided by PrimeLocation to give an indication of potential running costs based on various data sources. PrimeLocation does not warrant or accept any responsibility for the accuracy or completeness of the property descriptions, related information or Running Costs data provided here.